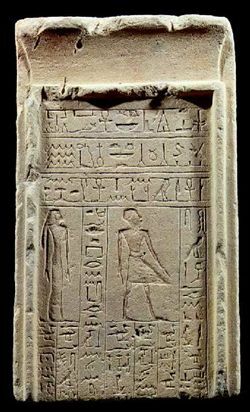 Rectangular funerary stela with frame in relief and a cavetto cornice. Horizontal (three lines) and vertical (seven columns, two of which are larger than the others) frame two standing figures, a man and a woman. The hieroglyphic texts are demarcated by incised lines. An offering that the king gives to Osiris, Lord of Life, so that he may give an invocation offering of bread and beer, oxen and fowl, alabaster, clothes, all good and pure things on which the god lives, for the ka of the beneficiary of the royal table, Hesemtjet, true of voice, son of Kakai. His son Mentuhotep. His son Siamon. His daughter Djamuenes. His daughter Neferu. His wife, Lady of the House, Reniseneb, daughter of Djanuenes. His daughter Semi. His daughter (...).